When you have a loved one with dementia, it sometimes feels like the disease is stealing their identity. But dementia is a diagnosis, not a definition. At Heritage Communities, we care for people, not symptoms. Our compassionate staff is skilled at caring for patients with Alzheimer’s disease and other forms of cognitive impairment. We take the time to get to know who our residents really are, so we can support them in ways that allow them to feel like themselves. Here’s what you can expect from our innovative Memory Care program. Heritage Memory Care uses our exclusive Portraits Program, based on Montessori philosophies and principles. The Montessori method began more than a century ago as a model for teaching children. More recently, researchers have discovered the same approach can benefit those living with dementia. 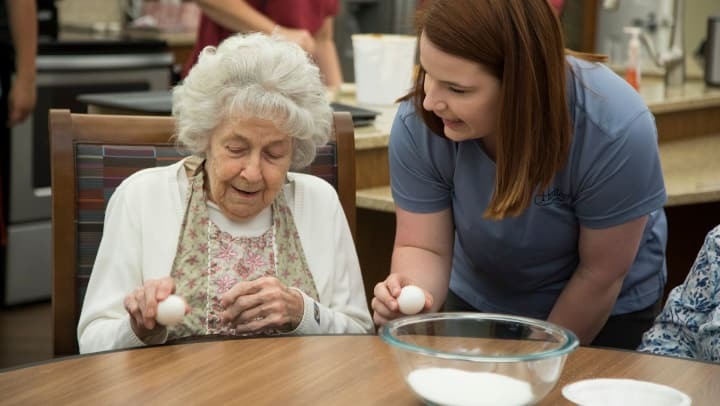 Through this program, we offer residents opportunities to engage in meaningful activities that respect their capabilities and their interests. While the methods are inspired by early childhood education, programming should not be childish. We make sure our activities and projects are simple enough for residents to tackle without frustration, but provide a sense of accomplishment and pride. It’s a delicate balance to craft meaningful moments that are child-like in simplicity, but enjoyable for adults. We’ve found that the outcome is well worth the effort. The Portraits Program is all about creating personalized experiences that give residents purpose. That process starts even before residents move into our communities. We ask family members to fill out detailed questionnaires about their loved ones’ lives: special events, jobs, hobbies and activities they enjoyed in childhood and through adulthood. We draw from those answers to design activities for each resident. For a resident who loves sewing, we might set out a pile of quilt squares and ask her to organize them according to pattern and color. Someone who worked in an office might enjoy sorting office supplies. An individual who was a skilled woodworker can sand blocks of wood, even if he can no longer use a saw or hammer. We also invite residents to help with everyday chores, such as clearing plates after meals, wiping down tables, folding towels or making beds. By participating in the tasks of daily living, residents feel trusted and capable. It’s wonderful to see the sense of accomplishment and joy residents experience when they give back to their community. In fact, many residents come to think of these activities as their jobs. Sometimes, it’s hard for family members to connect with a loved one who has dementia. Adult children might be afraid of saying something that will agitate their parent, or find it frustrating to have the same conversations over and over. One surprising benefit of our Portraits program: It frequently gives families satisfying ways to interact. Residents often invite their visiting family members to help them with their “jobs,” whether it’s sorting quilt squares, delivering snacks to other residents or creating flower arrangements for the dining tables. When caring for a loved one with dementia, there are often a lot of unknowns. When your loved one joins a Heritage Memory Care community, you can rest easy knowing that they will receive exceptional care and support in a safe, comfortable setting. Contact us to learn more about the Heritage Memory Care residences in your region.